An articulation question came up on Galway Flutechat about two books with articulation exercises, and how much they overlap. I discussed these two books, and two additional titles in my latest video: Best Flute Books (intermediate to advanced). 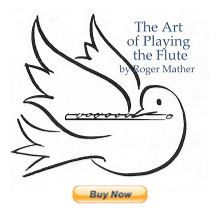 The books are listed on my flute reading page with links for interested flutists to buy them. Books 1, 2, and 4 all have good articulation descriptions and exercises. Book 3 by Wilkinson spends more time on intervals, tone, embouchure, dynamics, and very little on articulation per se. Another good book full of articulation etudes (once you've mastered the "how to" part) is Robert Stallman's "The Flutist's Book of Detache". It has about 200 tonguing etudes of the very best quality. Another excellent $50 book for the full on flute enthusiast. Best, and thanks everyone for the WONDERFUL comments and cheers!!!! You wouldn't know how cheered I am by my funny face that youtube chose for this video. I always wanted to audition for Kermit on the muppets! Jen, you have definitely built up a wonderful site over the past year. The videos are extremely helpful. I just wish we could somehow forward on to every band teacher (brass trained) to show the correct way to assemble/disassemble a flute and proper cleaning. It would probably put alot of repair technicians out of business though! Between you and Sir James' site, I think there will be alot of useful information and historical facts for years to come. I wish that somehow it could all be packaged up on an accessible site for all to access(like a library) one for Sir James, one on how to play the flute, etc. (You have a wonderful start - you're on your way to it). Perhaps a CD on everything you have available on your web site to accompany your book? Or maybe on a library of CD's on the life of Sir James and all the excerpts from his masterclasses to his interviews to his postings on his web site? Indeed, it would be an a monsterous task, but someday well worth it. I just wanted to you to know how truly special you are to the flute community online and the quickness of response to questions posed and the wealth of information you supply to all on your website and Sir James'. It is a great source of information and definitely I will be passing along to all of my students and others I meet for a long time to come! Have a Happy New Year! And look forward to what you will share with us in years to come. As many others have said Jen, thank you for your generous give of time and information. It is always a pleasure to visit your site. But what about the Jen Cluff book?? When might we find that on Amazon.com?? Gee, I wish the book was finished, but at least it's fascinating, and fabulous, (so far)!